Voilà, les premières décisions ont été prises par la direction d'Oriental Land Company Ltd. au sujet du développement de ses parcs Tokyo Disneyland et Tokyo DisneySea. Les premières attractions, restaurants, boutiques etc... sont annoncées pour 2019 à Tokyo DisneySea et pour le printemps 2020 à Tokyo Disneyland. Il ne s'agit que de la première phase du plan (jusqu'à l'année fiscale 2020), d'autres développements seront annoncés ultérieurement (le parc Tokyo DisneySea ainsi que les sept lands du parc Tokyo Disneyland sont concernés par la seconde phase du plan). Oriental Land Co., Ltd. has announced the plans through fiscal year 2020 (April 1, 2020 to March 31, 2021) for the further development of Tokyo Disneyland® and Tokyo DisneySea® Parks. In the 2014 statement, "Oriental Land Co., Ltd. in 2023," 2023 was set as the target for achieving a constant attendance level of over 30 million Park visitors annually due to sustained Guest satisfaction. Owing in part to the faster-than-expected increase in Park attendance since fiscal year 2014, the target has been brought forward to fiscal year 2020 and a portion of the previously announced investment plan has been reconsidered accordingly. Through continued investment of about 50 billion Japanese yen annually in the large-scale development of new areas of the Parks and new major attractions, as well as in enhancing the Guest services and facilities, Oriental Land will continue to improve the two Parks in a variety of ways. Tokyo Disneyland and Tokyo DisneySea will continue to evolve with unforgettable theme park experiences that are unlike anywhere else in the world. Grand Circuit Raceway, StarJets and some food facilities and shops currently in Tomorrowland will close permanently to make way for the proposed redevelopment. 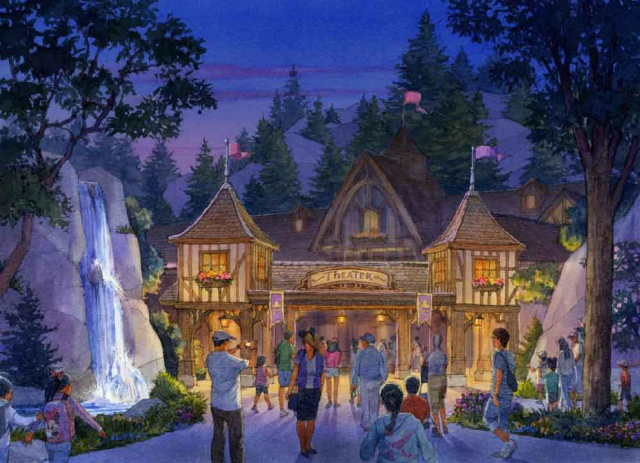 The expansion of Fantasyland will include a theater for live performances and a new area anchored by a major attraction themed to Beauty and the Beast. 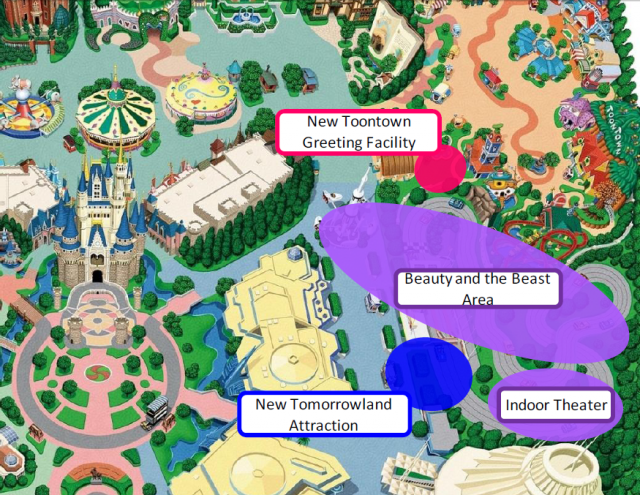 In neighboring Tomorrowland and Toontown, a new attraction and a Disney Character greeting facility will be opened in each themed land respectively. Total investment for the development of the new area and facilities is expected to be about 75 billion Japanese yen. In addition, plans are being developed for new versions of current attractions and Entertainment programs. This new area opening in Fantasyland will let Guests experience the world of the Disney film Beauty and the Beast. With the Beast’s castle and the village where Belle lives, the entire environment of this area will make Guests feel like they are in the film. Located within the Beast’s castle will be a major attraction themed to Beauty and the Beast that can be experienced only in Japan. And in the village, there will be a shop and a restaurant. musical adventure inside the enchanted Castle where she dances her way into the heart of the Beast, just in time to break the fateful spell. Guests will feel like they have entered right into the film. 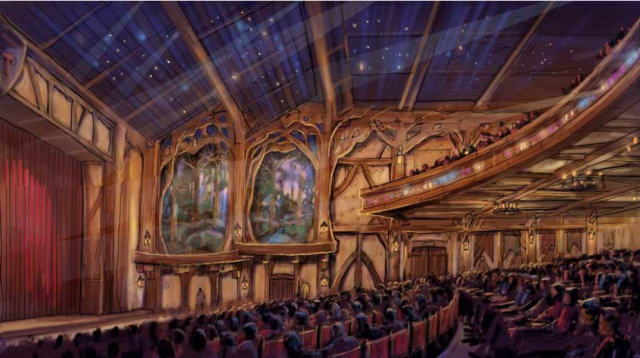 Opening in a new area of Fantasyland, this will be the first full-scale indoor theater for live entertainment at Tokyo Disneyland. Signature Disney entertainment unique to Tokyo Disneyland and featuring the Disney Friends will be presented in this storybook theater environment. 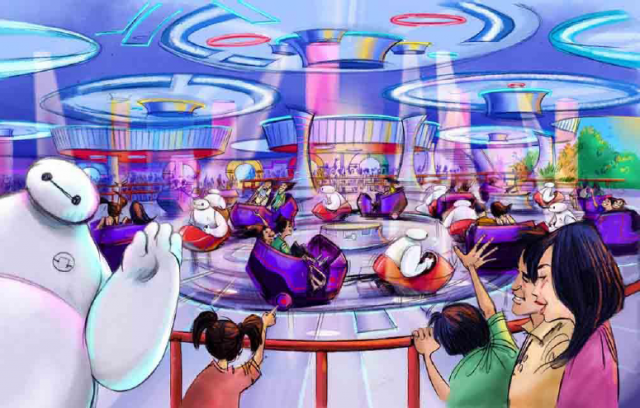 A ride-type attraction themed to the Disney film, Big Hero 6, will open in Tomorrowland. Also, for the first time in either Tokyo Disneyland or Tokyo DisneySea, a shop themed to outer space and selling popcorn in multiple flavors will open next to the new attraction. Description: The lovable robot Baymax, from the Disney film, Big Hero 6, invites Guests to join their own personal healthcare companion for an exciting musical “whip ride” that swings them unpredictably round and round. A new Disney Character greeting facility where Guests can meet Minnie Mouse will open in Toontown. Description: Minnie Mouse, as a fashion designer, will greet Guests in her studio dressed in fashionable costume. 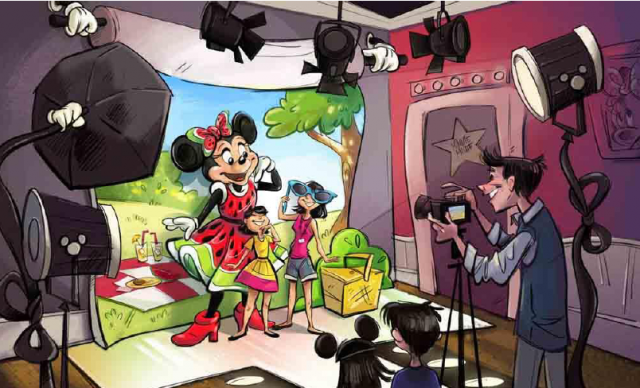 After walking through Minnie’s design studio and her work area with interactive elements, Guests can meet Minnie in person, take pictures with her, and generally spend a memorable time together. Notes: To make way for the new development areas and the new facilities, the following attractions in Tomorrowland will close: Grand Circuit Raceway in January 2017 and StarJets in autumn-winter 2017. 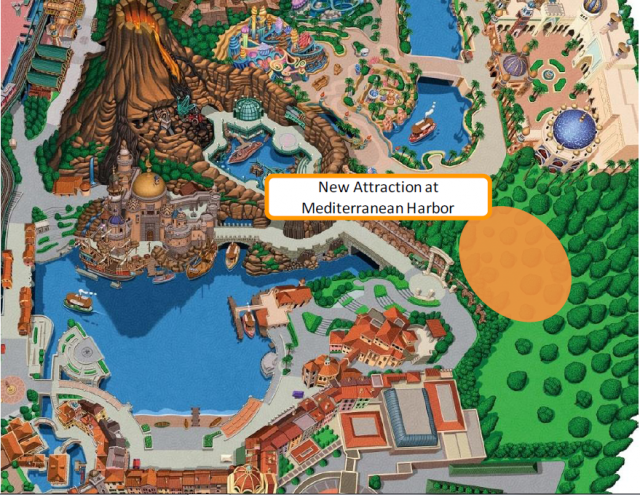 A large scale, simulator type attraction will open at Mediterranean Harbor in Tokyo DisneySea. In addition, plans are being developed for new versions of current attractions and entertainment programs. 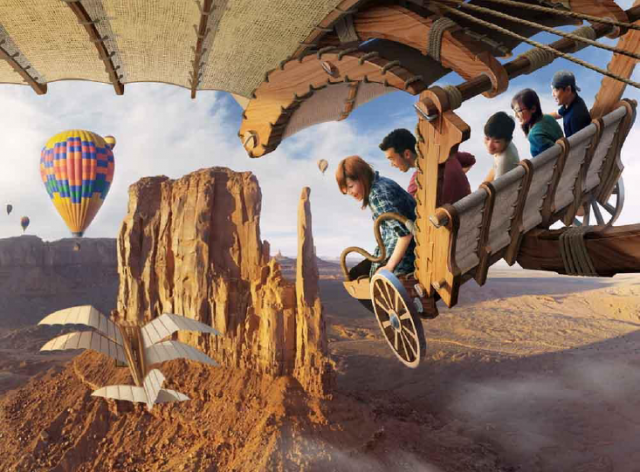 A simulator attraction, Soarin’ (tentative name), will open at Mediterranean Harbor in Tokyo DisneySea. This very popular attraction, which has been enjoyed by Guests visiting the Disney parks outside Japan, can now be experienced at Tokyo DisneySea with original scenes and the newest visual images. Description: Guests who visit the attraction overlooking Mediterranean Harbor will be able experience a journey soaring over famous landscapes of the world, while feeling the breezes and scents that match the various scenes. Oriental Land will expand the systems to educate and train Cast Members, thus raising their level of knowledge and skills for providing services to Guests, and together with communication measures and enriched award systems, will further promote the creation of work environments where Cast Members can sense their own growth and feel satisfaction in their work. Through these efforts, Cast Members, who play an essential role in Disney parks, will be able to offer Guests an even higher level of hospitality. In addition to expansion plans for attractions and entertainment programs, other measures will be taken to improve Guest experiences at the Parks shops, restaurants and service facilities. Investment plans for the further development of Tokyo Disneyland and Tokyo DisneySea, applicable for fiscal year 2021 and after, are currently being considered by Oriental Land. 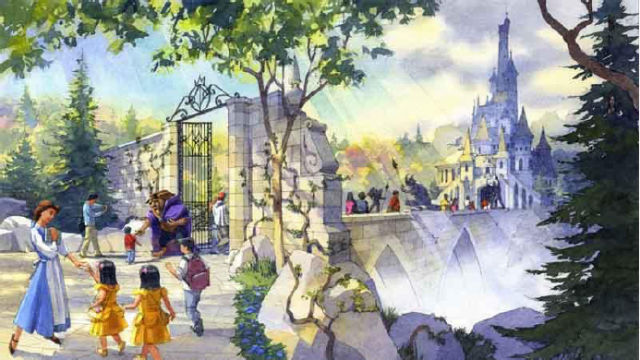 For Tokyo Disneyland, the new development plans will apply to all seven themed lands, including Fantasyland as mentioned earlier in this release. 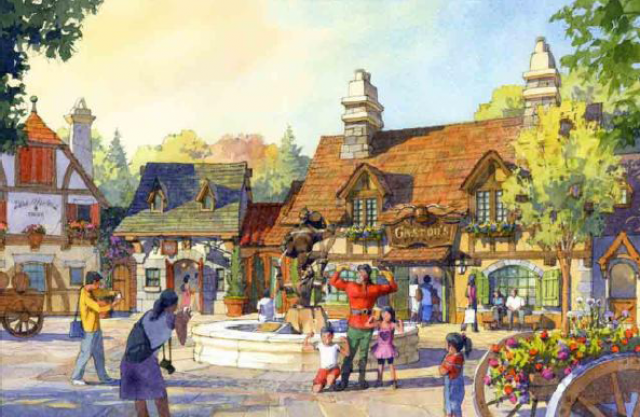 An area-based development for each themed land, to take place in stages, is intended to leave a lasting impact on the Park. 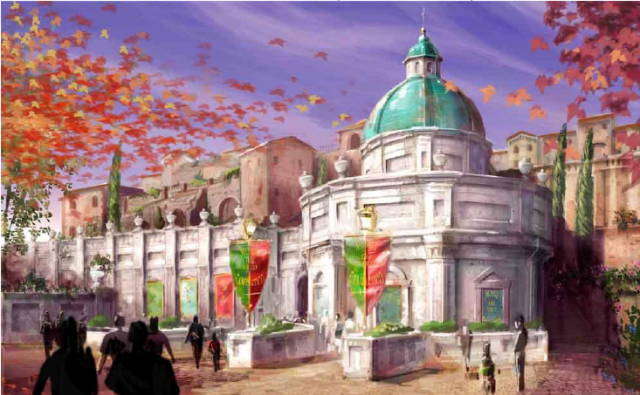 The large-scale development plans for Tokyo DisneySea, making use of multiple expansion sites, are meant to achieve a rapid evolution of the only Disney park themed to the sea, and thereby broadly raising the degree of Guest satisfaction from both a qualitative and quantitative standpoint. In addition, Oriental Land intends to investigate various ways to add more value to Tokyo Disney Resort® as a whole, such as increasing the number of guest rooms at the hotels within the Resort. Moreover, regarding plans for further growth through new business other than the Tokyo Disney Resort business, Oriental Land will continue planning for a new and separate business segment that is not constrained by a specific timeframe. Note: Other development plans to add value to Tokyo Disney Resort, other than those mentioned in this release, are currently under consideration. Those plans will be announced as soon as they are determined. Oriental Land Company Ltd. - 27 avril 2016. Donc leur Autopia (je sais plus comment il s'appelle la bas ) ferme ?? Oui, Grand Circuit Raceway fermera en Janvier 2017 et StarJets fermera à l'automne 2017 ou au cours de l'hiver 2017-2018 pour faire place à la zone "Belle et la Bête" et l'attraction inspirée du film d'animation Les Nouveaux Héros. Je me demande si la seconde phase comprend les projets annoncés précédemment, le land sur la Reine des neiges, le déplacement d'iasw (mais je me demande si le ride sur la Belle et la bête va occuper la place qui lui était dévolue), et des nouvelles attractions sur Alice, ou si le concept a été revu intégralement. Ça en jette vraiment leurs projets d'expansion et c'est bien-sûr sans compter sur ce qui est déjà actée et en cours. Et ce montant ne représente qu'une petite partie du budget total qui est de 500 milliards de yens répartis sur une dizaine d'années (soit une moyenne de 50 milliards de yens annuellement pendant la durée du plan). Même si une partie a déjà été soit utilisée soit attribuée ces douze derniers mois à divers projets de renouvellement, de mises à jour, de remplacements et de nouveautés, il reste largement de quoi ravir et surprendre le public d'ici 2024-2025 ! Au final, chacun des sept lands du parc Tokyo Disneyland connaîtra des nouveautés et améliorations, cela se fera progressivement afin de ne pas avoir trop d'impact négatif sur l'expérience des visiteurs (pas question d'avoir simultanément des chantiers dans tous les coins du parc). Cela ne signifie pas nécessairement pour chaque land de nouvelles attractions comme celles annoncées aujourd'hui à Fantasyland, Tomorrowland et Toontown car Oriental land Company accorde aussi de l'importance aux spectacles, restaurants et boutiques comme le récent renouvellement du spectacle au Polynesian Terrace Restaurant à Adventurland, la future boutique Bibbidi Bobb à World Bazaar (2017) ou le nouveau Meet & Greet à Westernland (2017) par exemple. Plusieurs nouveautés sont également prévues pour le parc Tokyo DisneySea (cela ne se limitera pas à la création d'un nouveau port; le remplacement de StormRider et l'arrivée de Soarin' devraient être suivis d'autres nouveautés réparties à travers le parc - comme pour le premier parc, de nouvelles attractions mais aussi le renouvellement et la mise à jour de spectacles, attractions, restaurants et boutiques actuels sont envisagés). Oriental Land Company souhaite également augmenter la capacité d'hébergement du resort et envisage un cinquième hôtel Disney dans les années à venir (on site comme les trois premiers) si il n'est pas possible d'augmenter le nombre de chambres des hôtels on site actuels (le taux d'occupation des hôtels on site actuels varie de 91 à 99 % selon l'hôtel et la saison. Le Tokyo Disneyland Hotel étant le plus réservé avec 96 à 99 % d'occupation, le Disney Ambassador Hotel étant le moins demandé avec 91 à 94 % d'occupation). L'entreprise va, de plus, renforcer sa présence marketing/vente sur différents marchés du Sud-Est asiatique (Chine, Taïwan, Corée du Sud, Thaïlande, Indonésie...) afin d'attirer plus de visiteurs étrangers. Perso, je suis surpris de certains choix. la belle et la bête est populaire, certes, mais ils laissent tomber Arendelle à TDS. Si la zone Beauty and the beast s'annonce très belle, ils vont utiliser une technologie trackless qu'ils auront déjà depuis 20 ans avec Winnie. C'est surprenant aussi. Où est l'innovation ? La salle de théâtre à 130 millions, surréalistes pour un espace de 1500 places !!! C'est clair le ride systme de Big Hero Six, ça ressemble a un des rides de Cars land ,celui avec la camionette ,il se font pas chier chez Ima . Pour ma part mis a part le budget qui en effet parait assez gros je ne suis pas vraiment surpris de ce retournement de situation. C'est sur que la zone Arendelle etait tres allechante mais je ne pense pas qu'elle soit completement mise de cote non plus. En 2020 Tokyo accueille les jeux olympiques, et j'imagine que le resort compte tirer son epingle du jeu pour attirer pas mal de monde a ce moment la. Mais ca necessite d'augmenter la capacite des parcs et leur attractivite en ajoutant de nouvelles attractions. A l'heure actuelle le Magic Kingdom est vieillissant et a besoin d'un nouveau dynamisme, et le parc Disney Sea est deja excellent. Du coup je comprend que dans un premier temps les efforts se concentrent sur le Magic Kingdom. Le projet actuel vise a construire une zone entierement nouvelle, en remplacant deux attractions sans trop d'affluence ni de succes par un gros E-ticket (Belle et la Bete) plus une attraction thematisee sur un film qui a tres bien marche au Japon (Big Hero 6). En prime ils gagnent une salle de spectacle (les japonais sont completement dingues des spectacles chez Disney et certains campent litteralement avec leur couverture et leur bouquin dans la queue des l'ouverture du parc pour avoir les meilleures places). La nouvelle zone complete sur la belle et la bete sera aussi un moyen d'agrandir la surface du parc pour diluer le flux des visiteurs, et sera sans doute tres appreciee quand on connait l'attrait des Japonais pour la France (je suis pret a parier que la touche "frenchy" sera tres presente dans le village de Belle). Je croyais aussi mais apparement le nouveau port d'Arendelle et toute la zone est encore dans les tuyaux. Ils n'ont pas accès à Marvel car USJ Company Ltd. en a l'exclusivité pour le territoire japonais (le deal date d'avant le rachat de Marvel par The Walt Disney Company). Par contre, Star Wars Experience a bien été proposé (ainsi qu'à Hong Kong Disneyland Resort et Shanghai Disney Resort). Dans l'article de Bloomberg (à lire dans le sujet suivant : http://www.disneycentralplaza.com/t44199p150-tokyo-disney-resort-le-resort-en-general-le-coin-des-petites-infos ), Akiyoshi Yokota, directeur général d'Oriental Land Company Ltd., confirme les plans pour un cinquième hôtel Disney à Tokyo Disney Resort. L'article nous indique que le dirigeant japonais et son équipe hésitent encore sur la catégorie d'hébergement du prochain établissement hôtelier : un hôtel de grand luxe manque encore au resort mais la demande d'une partie de la clientèle pour une option de logement bon marché est bien réelle elle aussi. Il y a donc deux segments à combler et quel qu'il soit, on peut raisonnablement penser que ce futur cinquième hôtel ne sera sans doute pas le dernier à voir le jour à Tokyo Disney Resort ! J'avais lu (je ne sais plus où) que le ride Spider Man allait fermé et donc pouvoir laisser OLC s'occuper de Marvel ? !